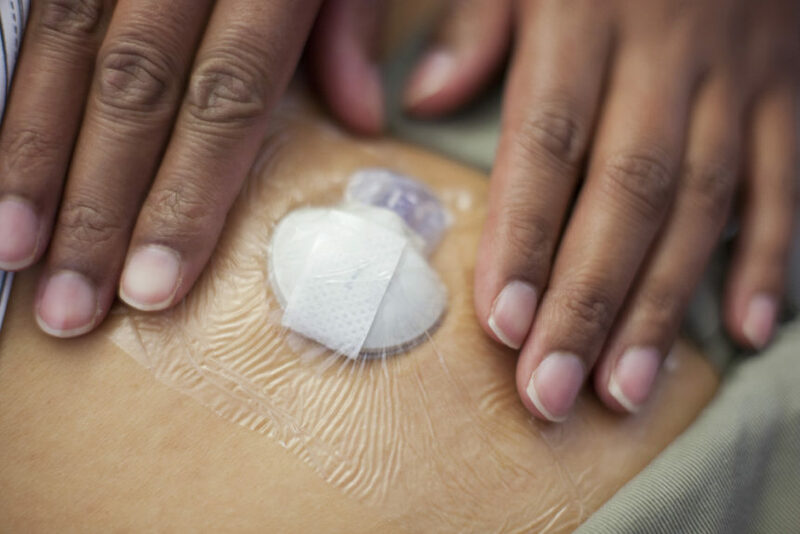 Investigators compared 2 methods of delivering bolus insulin, pen vs patch, using metrics from continuous glucose monitoring. ORLANDO – Using a pen or patch to deliver bolus insulin provided comparable results, according to results presented at the American Diabetes Association’s 78th Scientific Sessions held in Orlando, Florida, June 22-26, 2018. The results were driven by continuous glucose monitoring (CGM) measurements. The study is one of the first trials to show that CGM measurements can provide more clinically meaningful comparisons for glucose management. The study included participants with type 2 diabetes who used DexCom G4 CGM (n=97). The researchers used a self-monitoring of blood glucose-based titration algorithm to evaluate bolus insulin delivery by patch (Calibra Medical) compared with pen (Novolog Flexpen®). At week 24, participants showed significant improvement in hemoglobin A1c level. However, there was no difference between participants using the patch (6.82% ± 0.95%) vs the pen (6.70% ± 0.79%). CGM metrics indicated that the basal-bolus therapy increased time-in-target range significantly (70-180 mg/dL) with minimal significant hypoglycemia (<54 mg/dL). At baseline, insulin levels were in the target range 48.4% of the time, with hypoglycemia occurring 0.2% of the time. At week 24, patch participants reached target insulin range 74.1% of the time, with 1.1% of the time in the hypoglycemic range. At baseline, pen participants were in the target insulin range 42.4% of the time, with hypoglycemia 0.2% of the time. At week 24, target insulin range occurred in pen participants 75.2% of the time, with 1.2% of the time in the hypoglycemic range. M.L. Johnson: Research Support; Self; Abbott, Calibra Medical, Dexcom, Inc., Hygieia, JDRF, Medtronic, National Institute of Diabetes and Digestive and Kidney Diseases, Novo Nordisk Inc., POPS! Diabetes Care, Sanofi. D.M. Dreon: Employee; Self; Calibra Medical. B.L. Levy: Employee; Self; LifeScan, Inc. S. Richter: None. D. Mullen: None. R.M. Bergenstal: Advisory Panel; Self; Abbott, Glooko, Inc., Hygieia, Novo Nordisk Inc., Roche Pharma, Sanofi. Consultant; Self; Becton, Dickinson and Company, Johnson & Johnson Services, Inc., Medtronic. Research Support; Self; Abbott, AstraZeneca, Becton, Dickinson and Company, Boehringer Ingelheim Pharmaceuticals, Inc., Dexcom, Inc., Eli Lilly and Company, Hygieia, JAEB Center For Health Research, JDRF, Johnson & Johnson Services, Inc., Medtronic, National Institute of Diabetes and Digestive and Kidney Diseases, Novo Nordisk Inc., Sanofi, Takeda Pharmaceuticals U.S.A., Inc.. Stock/Shareholder; Self; Merck & Co., Inc.
Johnson ML, Dreon DM, Levy BL, Richter S, Mullen D, Bergenstal RM. Comparing patch vs. pen bolus insulin delivery in type 2 diabetes using continuous glucose monitoring metrics and profiles. Presented at: American Diabetes Association 2018 conference; June 22-26, 2018; Orlando, FL. Poster 73-LB.